OK I have to admit I do check out the station from time to time because they will throw in an occassional Beastie Boys, Cypress Hill, or House of Pain old school, and a Bob Marley song. 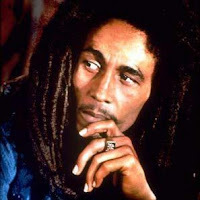 (Why do white guys love Bob Marley anyway? Does it give them an reason to feel more connected to their ganja?) Good thing this cookie cutter approach doesn't work everywhere. I'm sure it would spread everywhere. They tried the same thing in Baltimore at Alt rock Channel 104.3 (WCHH) and it's bombing in the ratings. In Hartford the format did poorly as well and Clear Channel ended up selling the station after flipping it from hip-hop Power 104.1. The bottom line is this... Radio 104.5 is one of Clear Channel's most profitable stations to their ...bottom line.